Do you sometimes find your computer has slowed to a crawl – usually when you’re in the biggest hurry to get things done? It’s not unusual and can be for a whole host of reasons. If you’re running Windows the operating system gets updated regularly and eventually slows down over a period of time. This is usually because you’re running a whole host of applications, virus checkers and other miscellaneous bits and pieces as well. However, slow operating computers aren’t only PCs, Macs sometimes slow down a bit over time. I hate to admit it, but upgrading to Windows8 can make a significant difference to the time it takes to boot up. We’re talking less than a minute as opposed to long enough to go and boil the kettle! Both Windows7 and Windows8 are hungry for memory so adding additional RAM will certainly improve the situation. It needn’t be expensive; in fact the cost of an extra 4GB will cover the cost in time saved over the next month or two! Consider swapping your hard drive for a solid state hard drive (SSHD) or, if you need lots of storage, a Hybrid drive. They are much lower in price than they used to be and they don’t use as much juice so, in a laptop, your battery will last a lot longer. Biggest bonus is a magical improvement in operating speed! 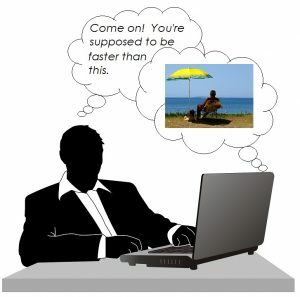 If you haven’t checked out your broadband lately you could still be operating on a slow download speed. Upgrading your broadband connection could make a big difference when you’re working online. This is particularly important if you are using storage in the Cloud. If you want to give your computer a new lease of life get it checked out. If you’re in the South East of the UK just give us a call and we’ll be happy to give your machine a health check.